Everybody in San Diego's culinary community knows Tommy Gomes. The face of Catalina Offshore Products, a local seafood wholesale and retail company, Gomes is a native San Diegan who comes from a long family history of professional fisherman. 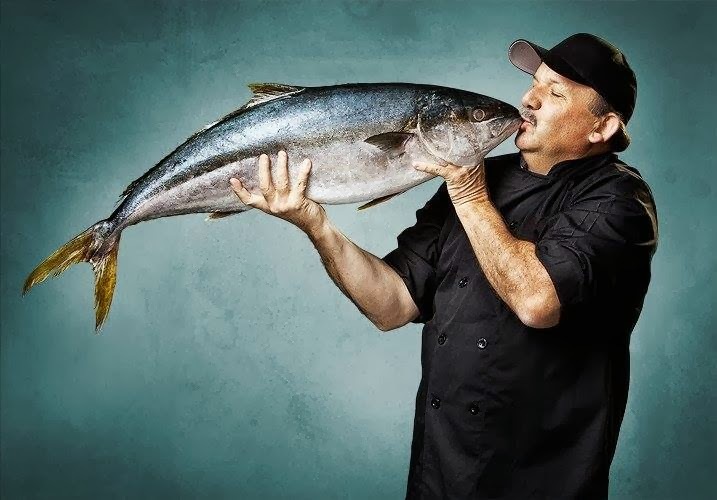 He personally works with more than 30 local restaurants to provide the freshest catch from Southern California and Baja. On February 23, 2014, the gentlemen behind the Mission Valley Craft Beer & Food Fest will pay tribute with a seafood and beer festival like no other - entitled San Diego Chefs Salute Tommy Gomes. Some of San Diego's finest chefs and breweries will join together at the Handlery Hotel on Sunday, February 23, 2014 from 2-5pm. This tasting event is organized by Handlery Hotel's Gus Thompson and Executive Chef Karl Prohaska (the guys behind the Mission Valley Craft Beer & Food Fest and a bunch of other awesome events) and will use Catalina Offshores seafood to prepare tasty offerings for participants to enjoy. With the amount of respect and admiration that local chefs and restauranteurs have for Tommy Gomes, this event is guaranteed to offer an incredible lineup of participating vendors. Tommy is also quite the cook, so he may even be dishing out some of his favorite recipes! The current line-up of participating chefs include: Anthony Sinsay, Matt Richman, Chad White, Tommy Fraioli, Katherine Humphus, Hanis Cavin, Matt Gordon, Alex Carballo, Jeff Bonilla, Rich Sweeney, Matthew Morrison, Brandon Brooks, Paul McCabe, Steven Molina, Jenn Felmley, Daniel Barron, Karl Prohaska, Karen Blair, Trey Foshee, Amy DiBiase, and Tyson Blake. Hess Brewing and Societe Brewing will be on hand pouring their fantastic beers and there will be other special guests and surprises as well. A limited amount of tickets are now on sale for this event at the cost of $75, which includes unlimited food and drink until the chefs and brewers run out! Get them while you can because this event will undoubtedly sell out. Stay tuned to SanDiegoVille for more information on San Diego Chefs Salute Tommy Gomes and visit the Facebook Event Page for real time updates.